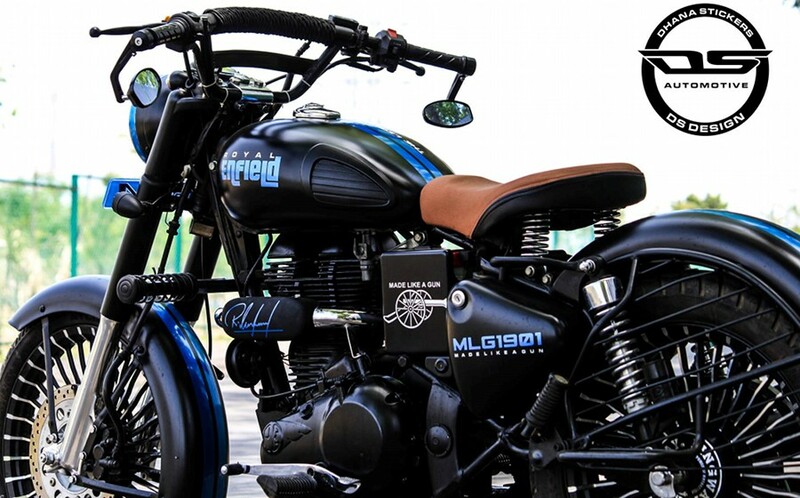 Modified Royal Enfield Classic 350 by DS Design: Classic 350 is undoubtedly the most impressive motorcycle ever built by the company. 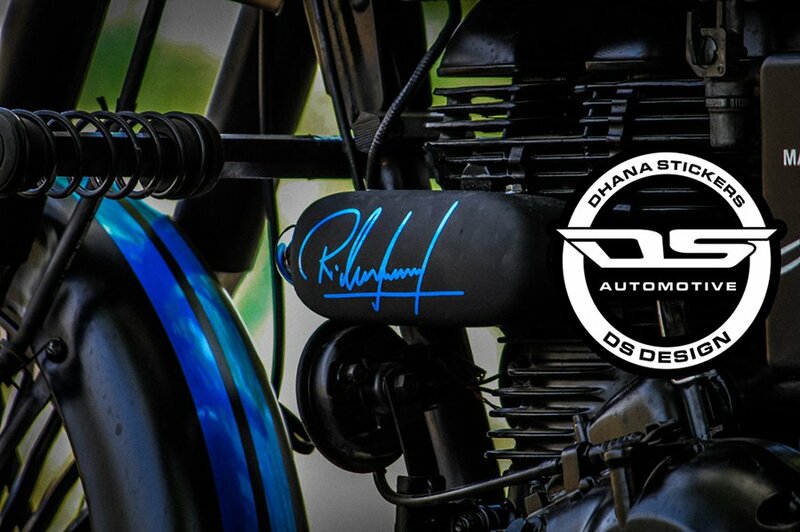 No other product ever achieved such high sales figures, resulting in Classic 350’s promotion to Royal Enfield’s favorite machine by dethroning the feature deficient Bullet 350. 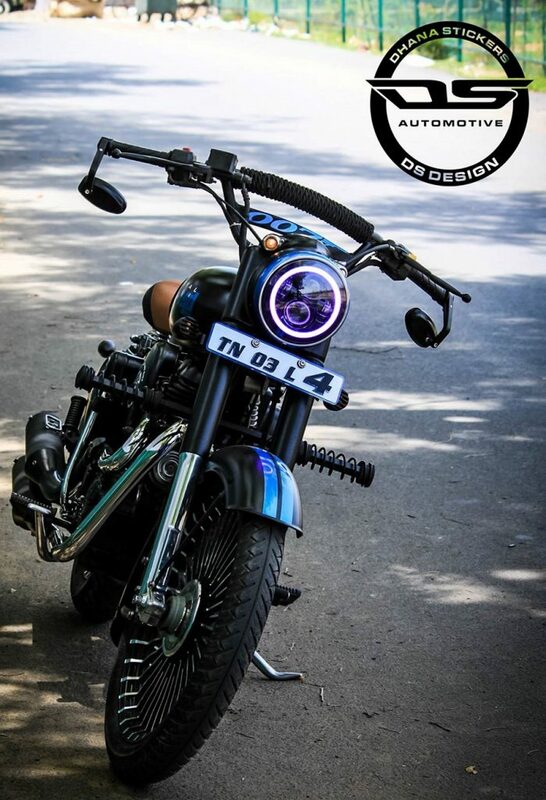 DS Design worked on one such Classic 350 and came out with this impressive dark themed machine that features blue highlights all over its body. The combination of low gloss shades along with accessory loaded body makes this blue machine a unique option among millions of stock Classic 350s. They first painted all of its frame black and started highlighting its unique body features through two parallel blue stripes. 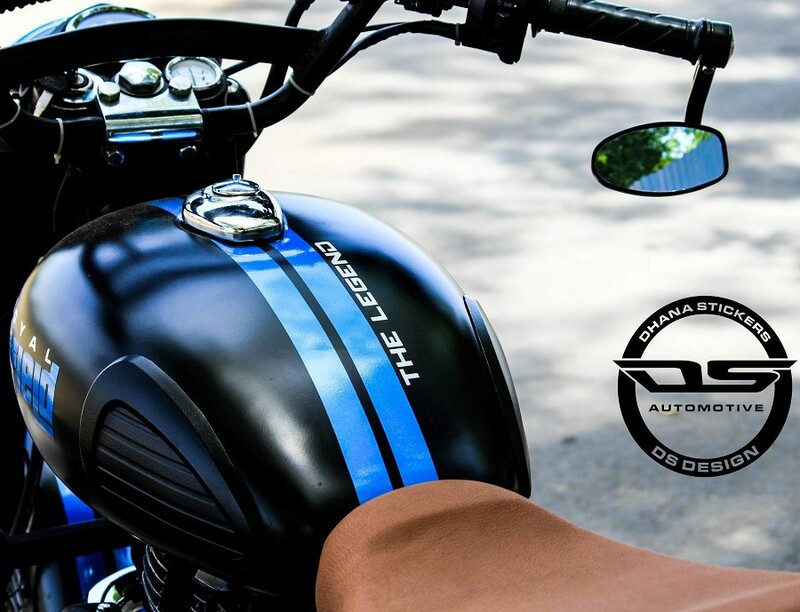 One can notice a clean curve in its overall design with Blue stripes flowing all the way down till its rear fender. 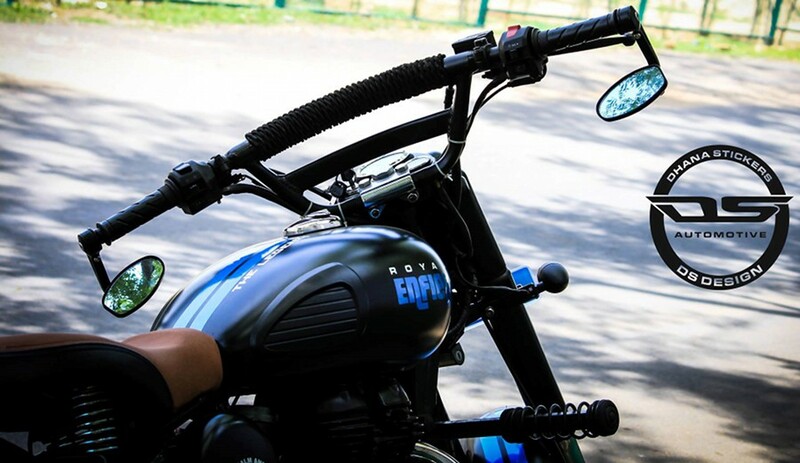 Pillion seat was removed to make that single front saddle more attractive than ever. DS Design even wrapped the seat in premium brown and black leather to achieve further detail in styling. 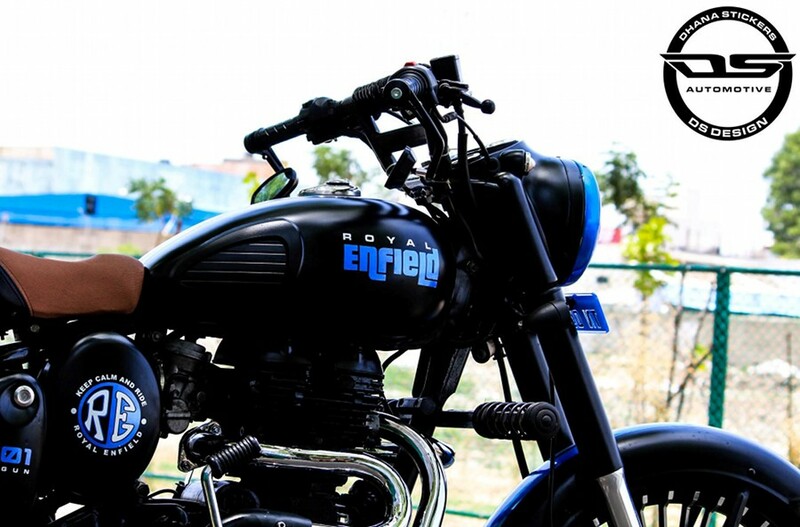 A custom font was used to place ‘Royal Enfield‘ on both sides of the fuel tank. 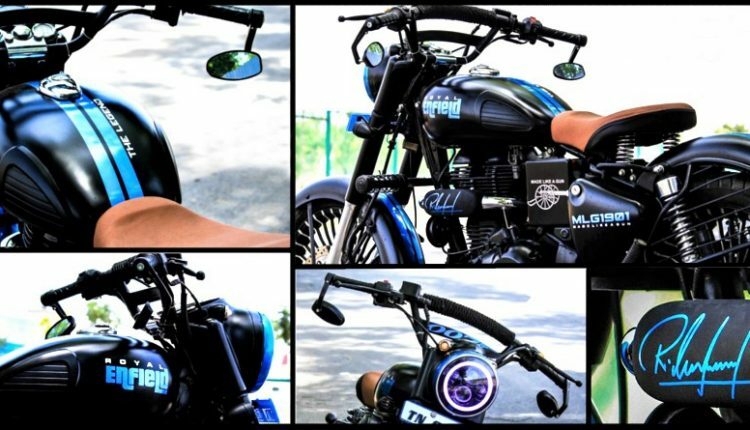 Stock handlebar was replaced with a higher placed, extra wide touring unit while bar end mirrors further add premium feel to this Classic 350. 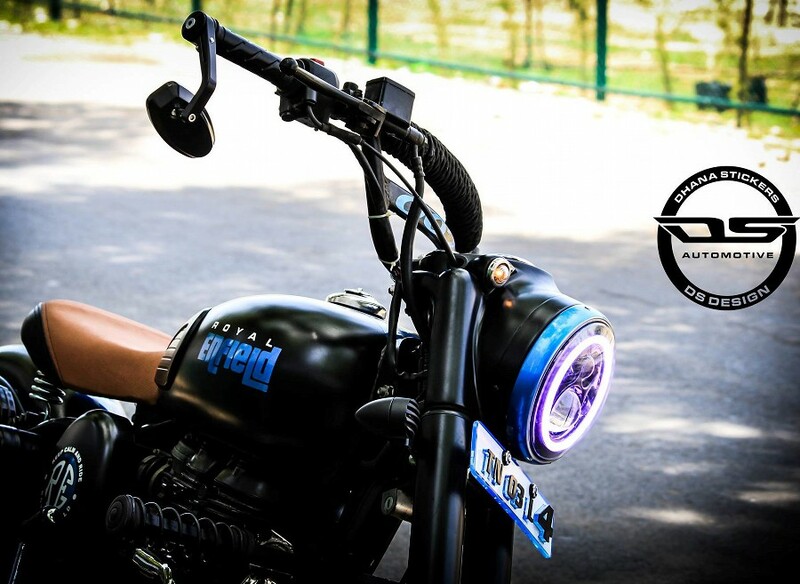 Front headlight gets replaced with custom LED unit that fits nicely into blue headlight panel. 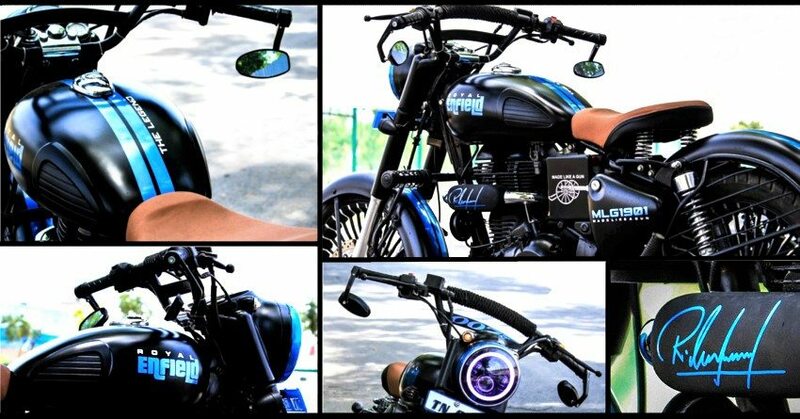 Engine on the motorcycle was painted matte black to achieve all black look in the lower half. Apart from these, one can spot a dual can exhaust system, multiple spoke alloy wheels and single bar leg protector on this Classic 350. RE Classic 350 is powered by the same 346cc, single cylinder engine that is good for 19.8 BHP at 5250 rpm and 28 Nm of torque at just 4000 rpm. The engine comes with 5-speed manual gearbox and uses front and rear disc brakes for better braking power in comparison to the Bullet 350 (Standard).